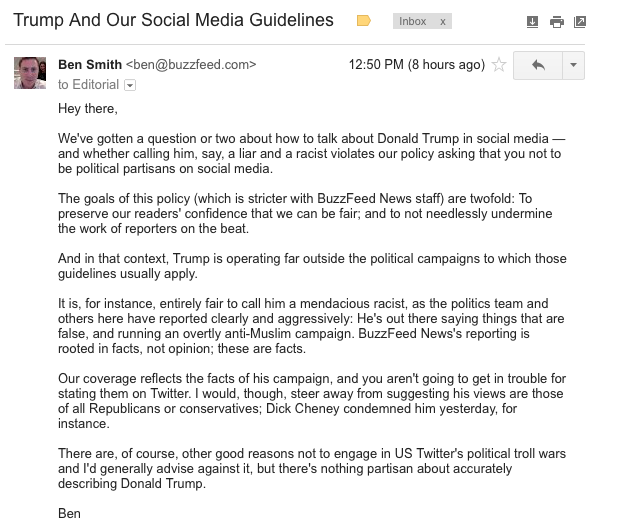 BuzzFeed editor-in-chief Ben Smith made news this week when he told his staff how they should address Donald Trump when he outright lies about issues. According to Smith's email, the staff is required to be more bipartisan in social media, particularly for the news staff who need to create the image of fairness for the site. But when it comes to Trump, it seems all bets are off. "Trump is operating far outside the political campaigns to which those guidelines usually apply," Smith wrote. "It is, for instance, entirely fair to call him a mendacious racist, as the politics team and others here have reported clearly and aggressively," Smith continued. "He’s out there saying things that are false and running an overtly anti-Muslim campaign. BuzzFeed News’s reporting is rooted in facts, not opinion; these are facts." So what's a columnist, blogger, reporter or talk show host to do? Well, here's what @Midnight host Chris Hardwick has done to help give reporters and journalists an idea of what to call Trump. Some publications are grappling with what exactly to call Trump. Well, here's some of our favorite suggestions.